Author Cynthia Cochran Kinard’s Newly Released “The Sanghunters” Continues the Kudzu Clan Series With the McKaine Siblings’ Struggle to Survive as a Family in Hiding. 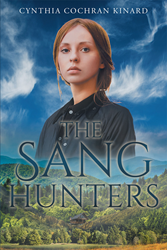 “The Sanghunters” from Christian Faith Publishing author Cynthia Cochran Kinard follows the McKaine siblings and their struggle to survive in the mountains of North Carolina. When their father, uncle, and grandfather go missing one by one, the oldest sibling Jessie must feed the family and find a way to raise enough money to pay the back taxes that threaten their hiding place. “The Sanghunters”: the adventures of a family struggling to survive and stay together while in hiding. “The Sanghunters” is the creation of published author, Cynthia Cochran Kinard, a portrait artist who has a BA in modern foreign languages and art. She lives with her husband, Jim, and their dogs, Skye, Jake, and Heidi Chey, at the top of a mountain in North Carolina. Cynthia spent much of her early years exploring her beloved mountains in Franklin, North Carolina. Her many adventures hiking, raising animals, and pursuit of art serve as the basis for her stories. Her work may be viewed at http://www.portraitlegacies.com. Published by Christian Faith Publishing,Cynthia Cochran Kinard’s new book follows the McKaine siblings as they struggle in hiding to keep their family together. The saga of the McKaine siblings continues in “The Sanghunters,” the second installment of the Kudzu Clan series. Hiding in their uncle’s secluded cabin in North Carolina, back taxes now threaten their mountain sanctuary. When their Grandfather leaves the mountain in a desperate attempt to find the missing uncle, the responsibility of feeding the family falls on the shoulders of the oldest sibling, Jessie. Jessie is determined to live by her faith and honor the promise made to her dying mother. Already struggling to keep the family together and meet their basic needs, she must now attempt to raise money to pay the back taxes on her uncle’s cabin by gathering ginseng in the wilderness alone. To make matters worse, she encounters someone she had seen when she was a child named Raine Roberts, who is a sanghunter, during a risky shopping trip to the general store. If he recognizes her, the handsome young man could put the whole family at risk. View a synopsis of “The Sanghunters” on YouTube. Consumers can purchase“The Sanghunters” at traditional brick & mortar bookstores, or online at Amazon.com, Apple iTunes store, Kobo or Barnes and Noble. For additional information or inquiries about “The Sanghunters”, contact the Christian Faith Publishing media department at 866-554-0919.